“Back in November 2010 I had gone to Siddaramaiah‘s Mysore house with Mysooru Mithra editor M. Govinde Gowda to invite him personally for my second son’s wedding. “As expected, the house was full of people spilling over to the road with many vehicles parked around. His aide took us to the dining hall where he was sitting at the head of the table alone, probably for our meeting. “After the initial courtesies and platitudes I gave him the invitation and requested him to bless the groom in a customary way. As is his wont, he was expressionless and silent for a while and said that he would come. “I did not believe him. “I asked him about the political mess the BJP was in at that time and he mumbled something that I don’t remember now. However, I told him that it was good that he joined Congress and Congress never disappoints its loyal members in the matter of rewarding them suitably. “He lifted his inclined head in slow-motion, looked at me and smiled. Who would not like to hear a positive prognosis of oneself? “I continued. I said in Karnataka, in the past many years of Congress rule, I had seen that senior Congress members who were ministers and aspired to become chief ministers had realised their aspirations even if it was only for two or three years, and gave the recent examples of Bangarappa, Veerappa Moily and S.M. Krishna (who was deputy chief minister like Siddharamaiah). “Therefore, you too will become the Chief Minister,” I told Siddaramaiah. “Now I could see his lips turn elastic revealing his teeth from right molar to left molar with a twitch of his snubby nose. Eyes too twinkled for a fleeting second. This entry was posted in Issues and Ideas, Kannada & Karnataka and tagged Churumuri, CLP, Congress, K.B. Ganapathy, Karnataka Photo News, KPN, Mysooru Mithra, S. Bangarappa, S.M. Krishna, Sans Serif, Siddaramaiah, SOM, Star of Mysore, Veerappa Moily. Bookmark the permalink. ← CHURUMURI POLL: Who will be the next CM? Siddu is great but the editor is like britisher. Like my Ajji used to say- ಗೆದ್ಧೆತ್ತಿನ ಬಾಲ. I am sure the amiable Ganapati had another story with a different name if someone else had become CM . It would be a refreshing news if Congress party indeed elected their leader thru a secret ballot! Hopefully that’ll become template for all parties at all levels. It is nonsense that the leaders are elected by ‘consensus’. If all folks agreed on any one thing, then there is something wrong. Congratulations to Siddharamaiah. Hopefully he’ll work out atleast as good as SM Krishna (if not better). @Gaby – my thoughts exactly. If fate had decided otherwise, this prophecy would be unknown to us. Siddaramaiah’s immediate political task (and most obvious promise to Italian Madam and golden spoon, perpetual kid) would be to ensure Karnataka returns a handsome number of MPs to the Congress kitty in the next major elections. That demands massive corruption of the super-stealth kind unlike what the crude, rustic politicians of the JD-S and BJP practice. Or what the Pawan Bansal, Raja, Mayawati, Sharad Pawar, Ajit Pawar, Lalu Prasad Yadav, Shibu Soren, Karuna, Reddy’s, Yeddi, Kanimozhi, Sudipta Sen, Vijay Mallya and so many thousands others out there, scamming the country and ruthlessly looting you! The other important priority for our Siddu (popular and a classic performer despite his weakness and non-cong-I psyche), would be to fund a significant part of the upcoming general election., literally billions will flow out of Karnataka’s treasuries to fund the golden spoon Prince’s campaign to get on to a pedestal, by hook or crook! Back to Karnataka, all is not lost for Kharge (by default a dalit hastag while all know him and hos son, as most corrupt billionaire’s from a region that has had ‘decades of drought’ with only promises that don’t quench any thirst anymore), considered to be the key cartel member. With Bansal and Ashwini Kumar caught red-handed and finally calling it a day, Kharge’s mega lottery ticket as rail minister will get confirmed in the Emergency quota by 7 Race Course Road. After all the public service, money machine called Cong-I has to run at 10X, with Patel’s and Oscar’s around, it’s as oiled as your nearest ATM machine! So if you are a Cong-I something in Karnataka, perhaps it is time to open more Swiss bank accounts, especially since the former goonda a.k.a Kharge Junior (and a few other sons of our politicians) is now officially a minister in waiting! Sadly, in midst of all the shocking, increasingly open, mega scams from all the parties and corrupt politicians in power, considering the track record of the BJP in Karnataka as well as the Cong-I in the center, it is indeed very sad to note that Karnataka’s acute needs and problems, especially in Infrastructure, Power, Water, Corruption, Governance, and many such core issues that really matter to the common man, will: regretfully , continue to be in the shadows. Siddaramaiah, is a no nonsense, blunt talking, impulsive politician who genuinely wants to prove that he is a performer, although his well known weakness is that he favor’s his own cronies, many of whom are confirmed crooked like the former Civil Aviation minister Ibrahim. Hopefully, the BJP does some serious soul-searching and swiftly decides on their only super star, as the PM candidate. Obviously, no need to mention any names. Most important nationwide elections in April is not far away and time is running out. Kick out many others, (much more corrupt than Yeddi) still basking in limelight in the party. Dump all such baggage and start afresh. Take the coastal belt for example, the most loyal saffron core…It’s really shocking to note that you have nothing more to lose! Moving forward, we now have slots for 33 ministers, 100s of corporations and board chairmans…etc. Let us hope, at least the garbage and traffic-jam icon called Blr, does not have the likes of Roshan Baig or Dinesh Gundu Rao or DKS or KJ George ..etc as ministers! Such well-known billionaire hawala and real estate czars rather continue and thrive their own not so stealth trade! Gaby, Faldo – Everybody has a story. Now it is Siddu’s time hence Siddu stories. For the 1st time we have CM who was born in Independent India. B.S.Yeddyurappa’s lip service that he will follow Gujrat model of development turned out be farce. He neither followed Bihar model. He actually ended up following Maharashtra model & gave us 3 CMs. Time has come for Siddaramaiah to realize S M Krishna’s dream of making Bangalore as clean as Singapore. He must build expressways connecting all towns of Karnataka. Assembly is 55% forward communities & 45% downtrodden. PS: This information is for the 45%. Rest already have this data. Assembly has 45% downtrodden?? LOL!! With average wealth of MLAs being 13crores, 45% downtrodden? Really? The bottomline is this. Caste of the MLA doesn’t matter – he will scam the exchequer and the public all he can. They will not be the downtrodden, and they won’t let the downtrodden improve – lest their vote banks disappear!! More so the folks who depend on downtrodden votes! Ref: PS: This information is for the 45%. Rest already have this data. 1) 55% of 223 is 122.65; 45% is 100.35. Which Communities contribute 0.65 and 0.35 legislators? 2) Can you please clarify who among your list are downtrodden? BC+SC+ST = 90. 3) Where are the Bunts and Reddys in this list? Though from Forward Community, I do not have the exact number. Together there may be atleast 10 of them. 4) Where are the OBCs? Where are the Kurubas? Dealing with caste in India is like dealing with Hydra’s Head. More you play with it, more they multiply. And this is what you are trying to do. After 10 years some party has come up with bare sufficient numbers to run the show and you are already out with the machete. Siddu’s cabinet can be expected to be heavily influenced by the corrupt Rahul brigade…most of whom were well known Goonda’s and history-sheeter’s in their respective colleges, constituencies and in the youth congress. The list will include Priyank Kharge, Krishna Byre Gowda, Dinesh Gundu Rao, Saleem Ahmed, Ajay Singh, Motamma, Roopa Muniyappa, Pramod Madhwaraj and many others, almost all of whom are already multi-corepati’s with massive real estate collections and mining licenses. Coincidently they all have or have had parents in various, lucrative Cong-I ministries and multiple Swiss bank accounts! With the Congress lead UPA-II in Delhi in its death bed, and world-record creating, massive scandals unravel ling at a breathless pace from CWG, 2G, Coalgate, Helicopter Gate, Railgate, Swissgate..huff and puff,….it will soon be the Congress cabinet in Karnataka State that will start the next wave of corruption-driven scandals. 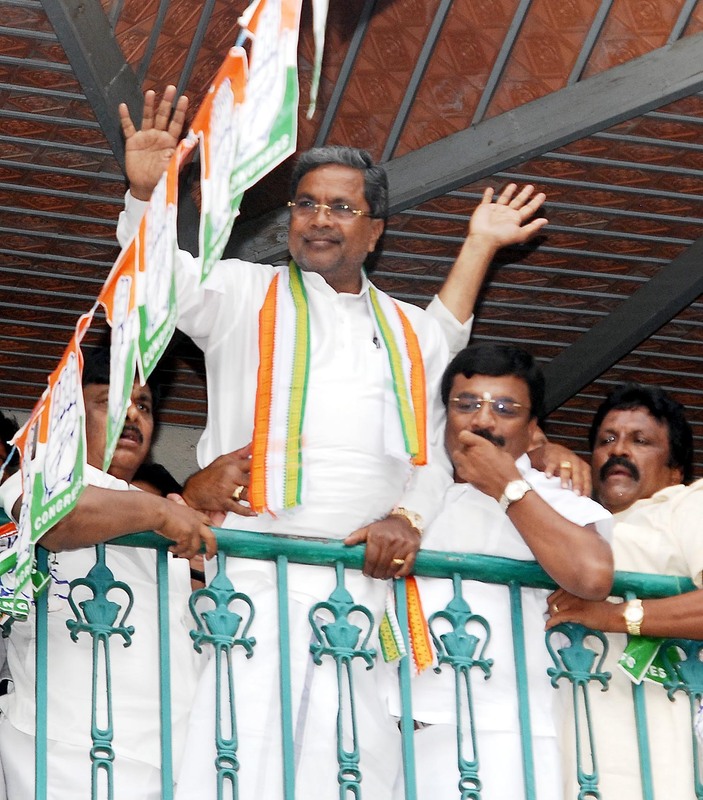 I am amazed that we already have forgotten that Siddharaamayya is a party-hopper in his quest for CMgiri. It is naive to think he will be any different from our recent CMs. By the way what are his declared assets? Does he have offspring being groomed for succession? paciFier- yes everybody has a story – when however a editor of an influential broadsheet ( I suppose you could call the SoM a broadsheet) comes with such a stupid story bordering on flattery it seems such a shame. I am not a reader of this paper but it doesnt seem Siddu was the object of affections or object of analysis till now. “CONGRESS BETRAYED DALITS IN KARNATAKA”. Dalits community voting Congress since 65years overwhelmingly. But Congress never made a Dalits a c.m. This time, 3 years ago Dr.Parameshwar took the responsibility when the chips were down n put the Congress to power. But his own party men deceitfully defeated Dr.Parameshwar in Koratagere (9-5-2013’s Andolana Newspaper), But the Congress did not react to this. Mallikarjun Kharge a Party loyalist since 41 years (he even put the names of Rahul, Priyanka n Priyadarshini to his children! ), 10 times winner denied c.m post. This time party got 95% of Dalits vote but denied c.m post. Mallikarjun Kharge is the reason for getting highest seats in North Karnataka but still he denied c.m post! Kharge’s bring the Airticle 371 j to Hydrabad Karnataka region n Built ESI Hospitals in Gulbarga, Bangalore, Davangere n Bellary. Kharge made Sonu many development works but Rahul n Sonia neglected it. Siddu came to CONGRESS only 6 years back and got the c.m post!!! 41 years loyalty did not get c.m post to Kharge. “RAHUL N SONIA BETRAYED DALITS IN KARNATAKA. THAT’S WHY DALITS TEACH A LESSON TO CONGRESS IN FUTURE”. @paciFier Thanks.If find only JD(S) & Congress having either a Christian or Muslim MLA. Siddu will tow “High Command” line; TN will get whatever they want from Karnataka. By the Way all Canals must have Concrete Bunds, there is 30% seepage into ground. Also afforestation of Ghats for ground water recharge. Downtrodden => Communities which score poorly in human development index. Communities, where maternal, infant, child mortalities are reality than just words in newspaper. errata: Siddaramaiah is 2nd CM to be born in independent India. HD Kumarswamy got there first. Considering the fact that there has been a complete sweep by Congress in Dakshina Kannada constituencies and major gains for the party in and around Bangalore, the common man will eagerly wait for the long delayed, properly asphalted highway between Mangalore and Bangalore. We have had hundreds of politicians promising this for ages, the public repeatedly venting their anger with road blockages and hartal’s, while the most crucial, arterial highway in our state is now completely unmotorable, unsafe with collapsed bridges all along, demonstrating the irresponsibility of all the legislators from South Kanara. I guess the crooked BJP MLA’s of the past will now enjoy their massive loot of the state exchequer while their leaders will chant ”Ketta Mele Budhi, Satha Mele Dhukka”. Aside to this, the crumbling infrastructure of Bangalore is screaming for attention. Well, if Siddu accommodates, some of the most renowned and proven corrupt Cong-I crook’s into his cabinet, I guess there is no ray of hope left for Karnataka with chronic Cronyism and corruption ensuring it is on par with Bihar. ”Vinashe Kaale, Vipareetha Budhi”. It is not just a handsome number of MPs. They also need handsome amount of funds for the lok sabha election. Karnataka is one golden goose which can fund the congress party election fund. Similar to how SM Krishna funded the 2004 elections. We will see a lot of corruption at a higher magnitude in Siddhu’s rule. Pacifier: Bottomline is, there are no downtrodden MLA, and no MLA really works for his ‘community’. They all look out for their own bank balance. It isn’t a wonder that average MLA wealth grows 500% to 5000% within a single tenure. The Indian democracy is designed to ensure this. If after 60+years, there is ‘downtrodden’ in our system, it is because the system doesn’t want to end the ‘downtroddenness’, and loose that vote bank. True growth is in economic opportunities available to all. HDI automatically improves if we can find jobs for everyone. And that can’t be achieved by providing handouts or by reserving a few jobs. What we need is radically different approach. Unfortunately we are stuck in 19th century framework. I think the editor, whatever his name is, is much better in reading palms than penning edits. He has a bright future as famed astrologer for the ultra-rich politicos. The Cong-I and UPA have decided to wash-off the acute corruption and policy paralysis taint with a Rs 280 crore ad blitz ‘Bharat Nirman’, written by Javed Akthar and filmed by Pradeep Sarkar. It will soon saturate TV channels, radios and newspapers targeted at rural India, while the metros are a lost case. Just imagine Rs 280 crore of tax payers money! Similar to the past, Jai Jawan Jai Kisan (Congress, 1965), Garibi Hatao (Congress, 1971) and many more. With foresight, while everyone is praying against all hopes that Siddu will restrict his cabinet to just a bunch of crooks with ministership, we can be absolutely certain that Karnataka will once again be milked to the fullest by the Cong-I moolah machine much before the next elections. It is indeed highly regretabkle to note that the CM has started off on a very bad note with the announcement of a slew of populist schemes, just to hoodwink people, while the state is almost bankrupt! Well, there are 17 MLAs trying their best to become a minister and do ‘public service’. All 17 have major criminal cases including causing death by negligence, criminal intimidation, forgery, causing disappearance of evidence of offence, breach of trust by a public servant, massive cheating and illegal payments in connection with an election…etc. The list includes Vijayanand Kashappanavar, B.M. Nagaraj, D. Sudhakara, Y.Y. Patil, B.A. Basavaraja, Qamar-ul-Islam, Ajay Dharm Singh, Umashree, S.P.R. Patil, S. Rafeeq Ahmed, S.S. Mallikarjun, D.K. Shivakumar, R.M. Lamani, Umesh G. Jadav, G. Hampayya, Jagadish Patil and Munirathna. Activist T.J. Abraham, in a letter to Congress vice-president Rahul Gandhi said: “Kindly do not let the people feel that the State has only jumped from into the fire from the frying pan”. Fact is that this is really true and we are seeing it in front of our eyes!